H2O Innovation Inc. (“H2O Innovation” or the “Company”) is proud to announce that it has won a Water/Wastewater prize, shared with the project’s engineering and construction partners, at the 2016 National Awards of Merit by the Design-Build Institute of America (DBIA). The prize was for the Clifton, Colorado Water District’s state-of-the-art ultrafiltration water purification system. This project is the first of its kind, using the FiberFlex open platform design. The Clifton Water District design-build project involved several engineering and delivery challenges. The construction of the new system had to be scheduled within the operating facility to coincide with the winter months, as the water flows are lower at this time of year, while still meeting the project completion schedule of less than 14 months. H2O Innovation teamed up with Carollo Engineers and PCL Construction to design, manufacture, construct and commission the ultrafiltration system that can produces up to 12.0 MGD (45,400 m3/day) of potable water. 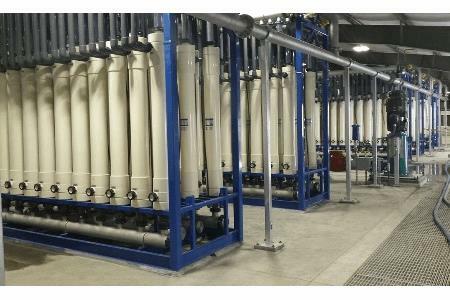 The use of the FiberFlex open platform design allows the customer to change membrane suppliers or models, allowing for a flexibility that isn’t offered by other ultrafiltration and microfiltration (UF/MF) equipment suppliers. This new generation of membrane racks offers owners and engineers the option to choose from a wider variety of membrane products available in the present and future market. “By showcasing design-build best practices, teaming techniques, contracting methods, and ways to drive innovation, winners of National Design-Build Project/Team Awards provide examples to the rest of the industry on how to achieve Design-Build Done Right”, stated Lisa Washington, CAE, Executive Director/CEO of DBIA. The National Award of Excellence (best in each category) as well as the Excellence in Design (Architecture), Excellence in Design (Engineering), Excellence in Process, Excellence in Teaming and the Project of the Year will be announced at the 2016 Design-Build Conference & Expo in Las Vegas on November 3. The Design-Build Institute of America is an organization that defines, teaches and promotes best practices in design-build. Design-build is an integrated approach that delivers design and construction services under one contract with a single point of responsibility. Owners select design-build to achieve best value while meeting schedule, cost and quality goals. For more information, visit www.dbia.org.